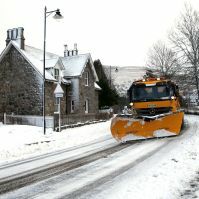 The Met Office describe the weather as a "real taste of winter"
Some of the biggest airports in the UK have been forced to cancel flights as snow and blizzard conditions sweep parts of the country. Heavy snow has hit Scotland, Northern Ireland and parts of England. Motorists and ferry passengers are also facing disruption with roads and bridges also being affected. More than 80 flights scheduled to depart from Heathrow Airport last night (Thurs) were cancelled because of the forecast of Arctic weather conditions that the Met Office described as a "real taste of winter". A Heathrow Airport spokesman said: ''The latest forecast is for snow this afternoon (Thurs), which will reduce the number of aircraft able to take off and land each hour. "Alongside our airline partners and NATS, we have taken the decision to reduce the flight schedule to allow airlines to rebook passengers onto un-allocated seats ahead of time where possible." Travellers are advised to take out trusted travel insurance to cover them for unexpected cancellations. Elsewhere, four flights were cancelled at Gatwick Airport. Gatwick advised passengers to check the status of their flight with their airline and apologised for any inconvenience. The weather has affected ferry services, with Caledonian MacBrayne warning of "heavy disruptions". Northlink ferries and Orkney Ferries also warned disruption was likely due to the weather. British Airways (BA) flights are among those affected at Heathrow. A BA spokeswoman said: "For safety reasons, Heathrow Airport, air traffic control and all airlines have agreed to operate a reduced schedule to help mitigate the effects of the snow which is likely to fall throughout Thursday afternoon and early evening." The airline is refunding or rebooking any affected customers onto alternative flights. "Customers on some flights can also choose to travel on alternative dates even if their flight is still scheduled to operate," the spokeswoman continued.